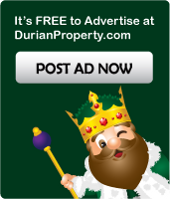 Combining over 20 years of experience from online advertising and mobile messaging solutions in various industries, DurianProperty.com is not just a platform, but a promise to provide security, reliability and ease in real estate ownership. For our Consumers – We believe that home is a necessity to everyone, thus purchasing a home should be an effortless task. We aim to let consumers need not worry about reliability of our ad listings, constant updates on their preferred locations or buildings, and protecting their data privacy. With easy ad reporting, through ad quality checking, 2-way enquiry posting services, and strict internal data access control, all these and more are possible. For our Classifieds Advertiser - With ZERO registration and membership fees, we encourage everyone to post quality and reliable ads for a more connected real estate ecosystem. Property owners or agents are encourage to register and post ads for FREE by login here. For Our Web Banner Advertiser - When come to business, our objective is simple: to provide advertisers with the highest ROI by generating genuine buyer leads and a wide audience at lowest price. Our low-cost, high return packages are made possible by understanding your advertisement objectives and then proposal of the most effective advertisement distributions. Call us at 1700-81-9911 or click here to contact us for more information.